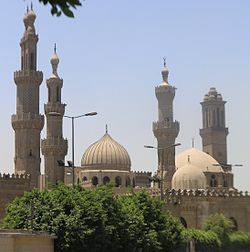 The foremost Sunni Muslim seat of learning, al-Azhar University in Cairo, has stirred controversy by issuing a considered legal opinion (fatwa) condemning the Shiite militias or “Popular Mobilization Forces” that are now fighting alongside the Iraq army to take Tikrit back from Daesh (ISIL or ISIS). To be fair, the al-Azhar has also condemned Daesh or ISIL. In fact, the Egyptian state has turned on political Islam in general and says it is fighting a Daesh branch in the Sinai Peninsula. But the timing of the opinion and its call for the Iraqi army to reconsider cooperating with the Shiite militias has given many Iraqis the impression that religious Sunnis in Egypt prefer Daesh to Shiites. Traditional Sunnism viewed Shiites as heretics (the differences between the two are about religious authority after the passing of the Prophet Muhammad and resemble in a vague way splits in Christianity such as that between Protestantism (I would argue it is more like today’s Sunni Islam) and Catholicism (perhaps today more like Shiite Islam). But from the 1950s, al-Azhar began a Dar al-Taqrib or office for Sunni-Shiite ecumenism. In 2005, the major Amman Statement condemned the practice of excommunicating or calling Muslim non-Muslims, whether they are Sunni or Shiite. The Saudi Wahhabi branch of Islam wasn’t as enthusiastic for this ecumenism, but even in Saudi Arabia the late King Abdallah put two Shiites on his national legislative advisory counsel, the embryo of the future Saudi parliament. Also to be fair, some of the Shiite militias have in fact been involved in ethnic cleansing campaigns and in atrocities against Sunnis, especially in 2006-7 but also more recently. Many Sunni Iraqis are afraid that they will commit reprisals against non-combatant Sunni populations who have cooperated with Daesh. (Sunnis who committed war crimes under the banner of Daesh should be arrested and tried; non-combatants are helpless once they have been conquered and should be left alone). But the fact is that there are perhaps 50,000 militiamen fighting in Takrit, a much larger number than the regular Iraqi army, and they are functioning as the US National Guards do, being local forces that can be called up for national campaigns. WSJ alleges that Iranian commander Qasim Solaimani, who is coordinating the Tikrit campaign, has been trying to moderate their behavior toward local Sunnis because he wants to improve Iran’s relations with Iraq’s north and west in the aftermath of the Daesh, fiasco, in which Iraqi Sunnis allied even with the horrible Daesh to escape Shiite rule. The al-Azhar ruling demonstrates the bind in which the current Iraq situation puts Sunnis in other countries. They almost universally despise Daesh/ ISIL, but it is hard for them to cheer Shiite militiamen on as they conquer a Sunni bastion like Tikrit. The Al-Ghad (Tomorrow) newspaper in Jordan exemplifies these anxieties, writing that the Tikrit campaign could put an end to terrorism in Iraq (most Jordanians really hate Daesh) or it could unleash a new round of it if the Shiites are not prudent and restrained (Jordanians are strong Sunnis on the whole). Some news outlets are alleging that the al-Azhar ruling was a favor to Saudi Arabia. Foreign Minister Saud al-Faisal is said to be upset that the Tikrit campaign is spreading Iranian Shiite power into Sunni Iraq. Saudi Arabia just announced another $3 billion grant to the government of Abdel Fattah al-Sisi. A more measured response from Iraqi Intellectuals takes the position that the al-Azhar clerics are not close enough to the scene to appreciate the ways in which the Shiite militias have moderated and become an arm of the regular Iraqi army. The article just cited also quotes an Egyptian jurist who argues that it isn’t right for a religious authority to give a fatwa about something when it is distant and not on the ground, but should leave that to local Muslims facing the threat.